These tasty hand pies were born out of the need to use up some ingredients I had in the fridge. They have since become one of my go-to snacks for potlucks, friday games night or just about any time we want something easy to make and even easier to eat. You could switch up the filling to suit your own tastes or even make a dessert version with fruit and cream cheese. Hmm.. stay tuned, I may just have to test that idea out for myself. Brown ground beef in a skillet and set aside. Chop bacon into 1/2 inch pieces, fry until golden and set aside to cool. Unwrap 1 package of crescent dough and divide into 2 square sheets. Place each sheet on a cookie pan lined with parchment paper. Pinch together the seams that run across each sheet. In a bowl, mix together cooled ground beef and bacon. Add remaining ingredients (except for crescent roll dough). 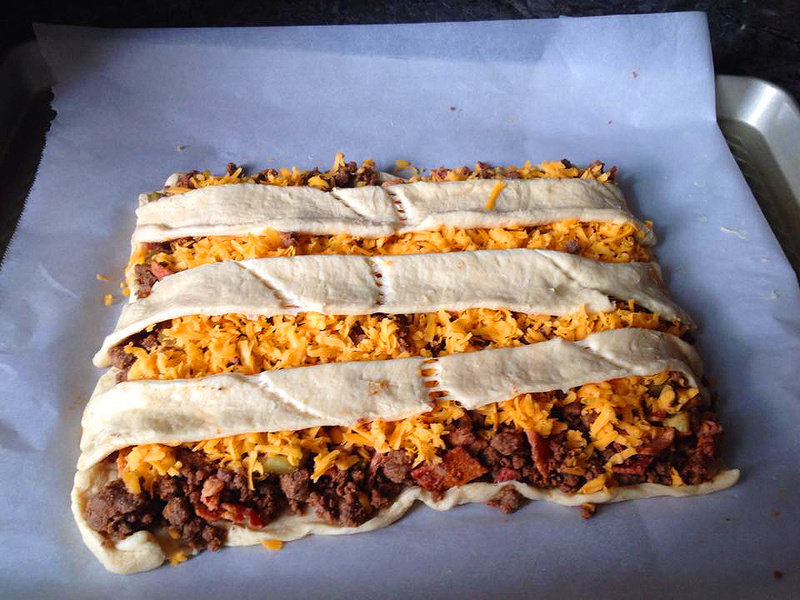 Stir to mix filling together, spread evenly over the 2 sheets of dough and top with cheese. Unwrap the second package of crescent dough and slice each half into 3-4 long strips. Lay strips over the top of the filling and pinch ends to seal. Bake at 375 degrees for 15-25 minutes or until golden brown. Let cool for 5 minutes and slice into hand pie squares. Serve warm with additional ketchup and mustard for dipping, if desired.